The Sheridan Yellowjackets kept their unbeaten streak alive as they overpowered the Lake Hamilton Wolves by a score of 20-6 on Friday, October 9. Sheridan used touchdown drives of 59 and 96 yards on their first two possessions to build a 13-0 lead at the end of the first quarter. The Yellowjackets’ first score came with seven minutes left in the quarter. Scott Herron caught a 24 yard pass from Brad LaRue for the touchdown. Larry Campbell added the extra-point to give Sheridan a 7-0 lead. 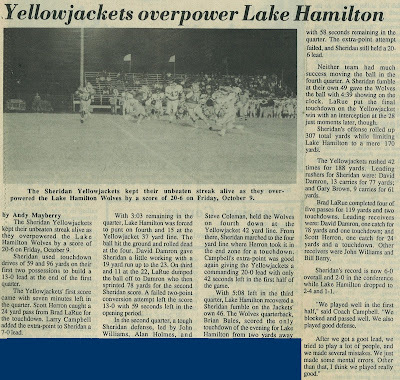 With 3:03 remaining in the quarter, Lake Hamilton was forced to punt on fourth and 15 at the Yellowjacket 37 yard line. The ball hit the ground and rolled dead at the four. David Damron gave Sheridan a little working room with a 19 yard run up to the 23. On third and 11 at the 22, LaRue dumped the ball off to Damron who then sprinted 78 yards for the second Sheridan score. A failed two-point conversion attempt left the score 13-0 with 59 seconds left in the opening period. In the second quarter, a tough Sheridan defense, led by John Williams, Alan Holmes, and Steve Coleman, held the Wolves on fourth down at the Yellowjacket 42 yard line. From there, Sheridan marched to the four yard line where Herron took it in the end zone for a touchdown. Campbell’s extra-point was good again giving the Yellowjackets a commanding 20-0 lead with only 42 seconds left in the first half of the game. With 5:08 left in the third quarter, Lake Hamilton recovered a Sheridan fumble on the Jackets’ own 46. The Wolves quarterback, Brian Bales, scored the only touchdown of the evening for Lake Hamilton from two yards away with 58 seconds remaining in the quarter. The extra-point attempt failed, and Sheridan still held a 20-6 lead. Neither team had much success moving the ball in the fourth quarter. A Sheridan fumble at their own 49 gave the Wolves the ball with 4:39 showing on the clock. LaRue put the final touch on the Yellowjacket win with an interception at the 28 just moments later, though. Sheridan’s offense rolled up 307 total yards while limiting Lake Hamilton to a mere 170 yards. The Yellowjackets rushed 42 times for 188 yards. Leading rushers for Sheridan were: David Damron, 13 carries for 77 yards; and Gary Brown, 9 carries for 61 yards. Brad LaRue completed four of five passes for 199 yards and two touchdowns. Leading receivers were: David Damron, one catch for 78 yards and one touchdown; and Scott Herron, one catch for 24 yards and a touchdown. Other receivers were John Williams and Bill Berry. Sheridan’s record is now 6-0 overall and 2-0 in the conference while Lake Hamilton dropped to 2-4 and 1-1. “We played well in the first half,” said Coach Campbell. “We blocked and passed well. We also played good defense.